Despite only having 48 pages this is packed with photos and information. 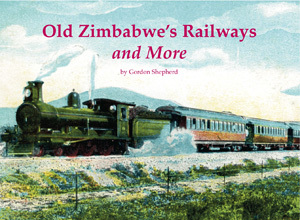 Complementing the author’s similar book on Zambia’s railways this illustrated collection of old photographs is from ‘back in the day’ when these two countries formed Rhodesia, the chunk of southern Africa purloined by Cecil Rhodes in the name of Empire. Having dealt with seven years of turbulence and pestilence, and having subjugated the native population, Rhodes’ British South Africa Company set about building railways to exploit the natural resources. The author tells the story of the building and development of the railways by means of his collection of old photographs, postcards and ephemera he has put together in many years of collecting.